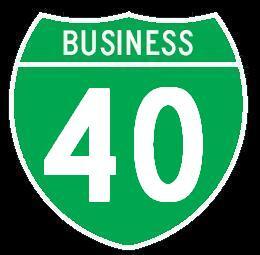 Interstate 40 runs east-west across Central Oklahoma. This enters the state from Arkansas, near Fort Smith, AR. It exits the state on the westside into Texas, near Erick, OK. From Oklahoma City to the Texas State Line, this runs along the Historical U.S. Rt. 66 corridor. 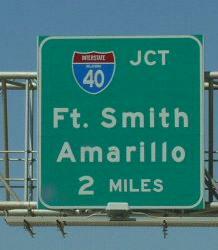 Most of the business loops from Oklahoma City to the Texas line are on the former alignments of U.S. Rt. 66. While in Oklahoma, I-40 is multi-plexed. ...U.S. Rt. 62, from near Henryetta, to near Okemah. ...U.S. Rt. 270 from near Shawnee, to near Calumet. ...Oklahoma State Route 3, from near Shawnee to Oklahoma City. ...Interstate 35, at Oklahoma City. ...U.S. Rt. 62, at Oklahoma City. ...U.S. Rt. 77, at Oklahoma City. 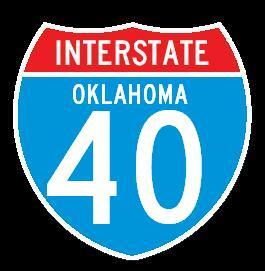 In Oklahoma, Interstate 40 crosses the following interstates. 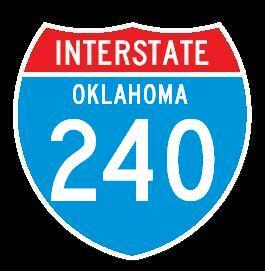 Interstate 240, at Oklahoma City. Interstate 35, at Oklahoma City. Interstate 235, at Oklahoma City. Interstate 44, at Oklahoma City. Branches of I-40 in Oklahoma.